Royal Dynasty slot game by Novomatic is one of our most well-loved slot games here at NovomaticCasino.co.uk. It takes you back in time and gives you plenty of chances to win, especially during the extremely generous free spins! Right from the moment you load the game, you’ll feel as if you’ve gone back in time to the middle ages. The background is filled with a medieval royal crown and medieval golden coins. The characters are dressed in all sorts of different medieval clothing and costumes and the other symbols are all very medieval in design. Fans of Fruits ‘n Royals, Knight’s Quest and Book of Ra Deluxe will enjoy this Novomatic slot game. Travel back to the middle ages with Royal Dynasty and transform yourself into a royally rich slots player! With 5 reels and 20 paylines, this slot gives you plenty of ways to win! For you to get payouts in Royal Dynasty slot game, you’ll need to spin three or more matching symbols on an active winline! The symbols must fall on consecutive reels from left to right. The size of each payout will depend on the combination of symbols as well as your bet amount. Your bet amount is displayed for you at the bottom of the screen, along with your balance and your last win amount. You can change your bet at any time by using the plus and minus symbols to either increase or decrease the number of lines you’re betting on as well as the amount you’re betting on each line. You can then check the paytable to see how much each combination will pay you! The lower-paying symbol in this Novomatic slot game include card symbols from 9 through to the Ace. Then there are golden coins, a shield, a falcon, a lion statue, a scribe, a prince, a princess and a king! During the normal game, the king is extra special as he can substitute for all other symbols. Both the prince and the princess are Scatter symbols in this online slot game, which means they pay out wherever they land on the reels. What’s more, they also trigger the bonus feature! Spin three or more prince or princess symbols and you’ll get a number of free spins! During these free spins, the Scatter symbol which didn’t trigger the bonus feature will become the king symbol and will substitute for all other symbols and pay x2! You can also win more free spins by spinning three or more of the same Scatter symbol which triggered them in the first place. So, during Royal Dynasty slot game, it’s easy to stack up a large amount of free spins, as each time you can get up to 45! 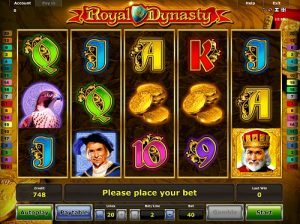 Like many other Novomatic games, you can play Royal Dynasty slot game for free until you’re ready to play for real! Once you’ve got the hang of the game, you can put it into ‘autoplay’ mode and watch as the reel spin themselves for you. You can also gamble your bets using the gamble feature, and this is a great way of turning small wins into big ones! See if you can make it to the top of the gamble pyramid with your quick reactions! Here at NovomaticCasino.co.uk, we offer our players a myriad of entertaining games which give player the chance to transform their wealth from that of a pauper to that of a royal! Our live casino games and table games are perfect as they offer great return to player percentages (RTP). Choose between: Live Poker, Live Roulette, Live Blackjack and Live Baccarat and go from rags to riches in no time!